Midi Pyrenees, the largest region of France, is extremely multi-faceted. The region extends from the Perigord to the Pyrenees along the border with Spain and through Gers into the Lot Department, East of Dordogne. Its Northeast includes areas of Causses which are plains, little valleys, thick forests, pine woods and isolated plateaux. The region’s many faces provide a plethora of cultures, landscapes and even aromas. The Midi Pyrenees region was influenced by external forces even during the Bronze and Iron ages. Toulouse was the Visigoth Kingdom capital between the 3rd and the 5th centuries. After the death of Charlemagne in 801, the Counts of Toulouse brought the Rouergue and seven other cities under their control. Perpignan became the capital of the Majorca kingdom and the Balearic Islands. Toulouse then came under French rule in 1271. The territories of Pays de Foix and Bigorre were held by the Kings of Navarre until 1512 and were later reclaimed by Spain’s King Ferdinand. These were returned to France in the 17th century. Lourdes is one of France’s leading tourist resorts with over 5 million visitors each year. Lourdes is sought for its spiritual and healing powers. Masses are offered here in over 22 languages during the day and night. The Saint Pius Basilica, which can accommodate over 25,000 people, is a truly inspiring structure. The Le Pic du Jer, which is known for its large cross, is about 1000 meters high and is reached by a chair lift in just 6 minutes. There is also a glacier lake spread across 55 hectares. The Mauvezin Castle of the 11th –14th century provides and amazing view of the Pyrenees. 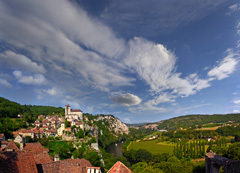 The villages of Conques and Belcastel in the Northern Midi-Pyrenees, are extremely beautiful and an absolute must-see. Conques by the River Dourdou, has several medieval houses lining the mostly cobbled streets. The Saint Foy Abbey with its renowned treasury that includes the golden statue of St. Foy herself, is a UNESCO World Heritage Site. Belcastel on the banks of the River Aveyron has a castle that towers over the surroundings. The centuries old houses here are notable for their lauze stone roofs. An attractive stone bridge made of five arches spans the river. The medieval town of Rodez has the Gothic Cathedral of Notre Dame constructed between the 13th and 16th centuries, which is built in redstone. Medieval streets with shopping lanes for pedestrians spread out behind the cathedral, where Gothic wall art is evident. There are also open-air markets that take place about three times a week, throughout the year. Annual events here are very popular, like the Bastille Day on July 14th, which includes a spectacular fire display. There is also a music festival in mid July. To the West of Rodez is the small village of Peyrusse le Roc. Beneath the village, there is an older village set on a cliff, which was discovered in 1970. Paths have now been cleared to reach this abandoned village. The nearby town of Millau has the Montpellier le Vieux Park, which is indeed a fascinating place with unique rock formations. The park includes a section of Causse that has eroded over time resulting in a spectacular series of limestone outcrops. The Roquefort Caves here are attached to cheese factories where one can find the history of cheese making. The Millau Bridge across the River Tarn is the tallest vehicle bridge in the world. The town of Auch has a remarkable main square Place de la Republique with the Cathedral Saint Marie, which has been included in the UNESCO list. The cathedral has hand carved oak stalls and two 16th century towers. The 40-meter high Tour d’Armagnac located in the Salinis area used to be a prison in the 14th century. The Escalier Monument or ‘The Great Staircase’ is 35 meters high with 234 steps. The monument provides a panoramic view of the entire Gers valley. Toulouse, the fifth-largest city in France, is the home of the Neoclassical Place du Capitole. Built from the characteristic pink brick, it dates to 1750, and was constructed according to plans by Guillaume Cammas.. The 11th century Saint Sernin Church with its characteristic tower is a UNESCO heritage site.